I hate having to pay a fee to withdraw money from my poker account so I'm pretty happy about news from Juicy Stakes Poker today saying that we can now make one withdrawal per month for FREE. You won't get charged any processing fees if you've accumulated the required net rake (Gross Rake minus Rakeback and Bonuses). 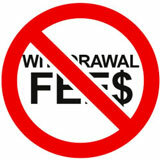 For subsequent withdrawals, regular check and Western Union withdrawal processing fees apply. Juicy Stakes has top-notch, international payment processors including credit card and e-wallet solutions that give us the option of funding our virtual account using a credit card for easy transfers to and from Juicy Stakes. Juicy Stakes Poker players who have won their way to live tournaments in exotic locations in online satellite tournaments share their online and live tournament experiences on the Living the Dream poker blog.